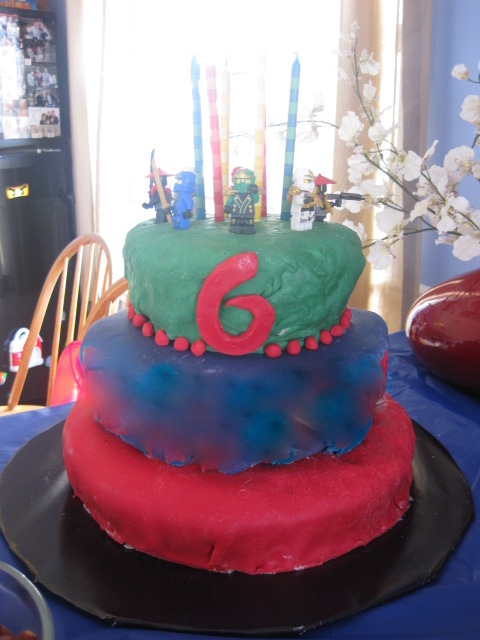 Mr. C turned six years old, and when I asked him what he wanted the theme of his birthday party to be, he knew he wanted it to be Ninjago. For those of you not familiar, they are Lego ninjas that have a tv show on Netflix. 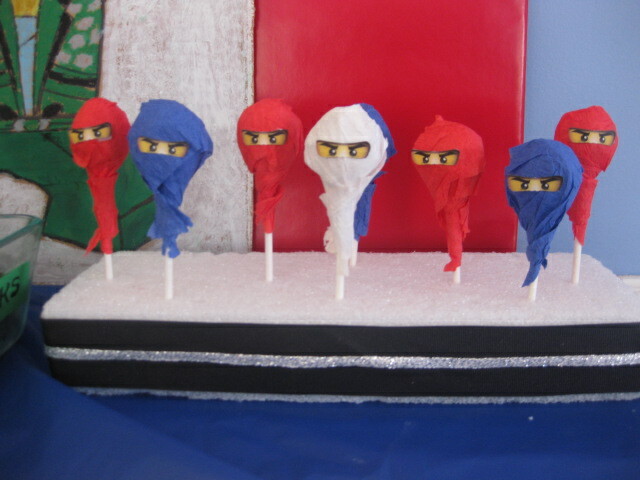 When the ninjas fight the “bad guys,” they say, “Ninja…go!! !” which, I guess, is where they got their name! 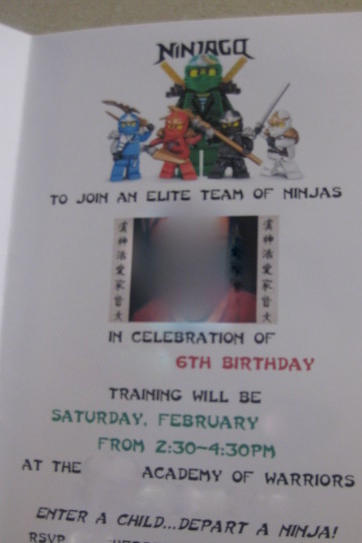 Here is the invitation with Mr. C’s eyes showing through the golden ninja on the front (which I blocked out for this picture). We’ve done something similar with tootsie roll pops before for our superhero party, but I liked these better since they were wrapped in streamers. I found the idea here, and the ninja eyes here. 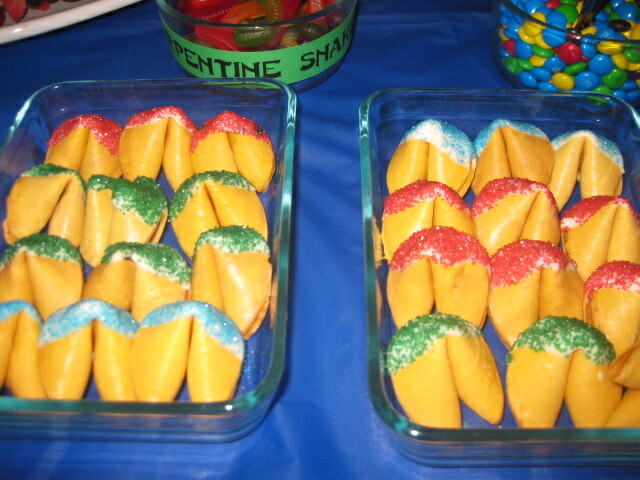 What’s a Japanese ninja party without fortune cookies? Why not make them even better by dipping them in candy melts and sprinkles? 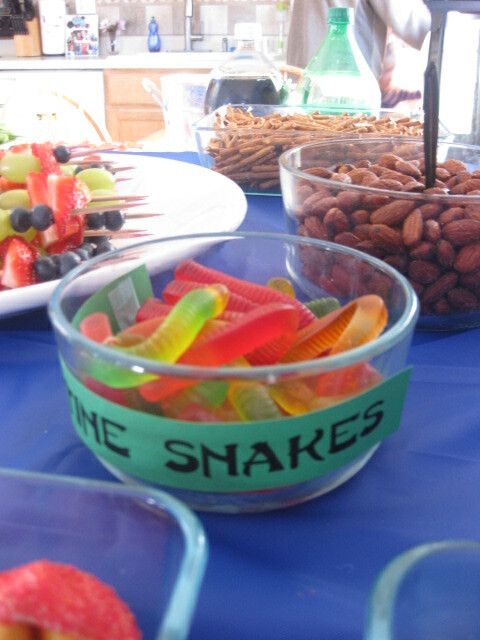 Gummy worms made some nice “serpentine snakes” so the kids could dispose of the “bad guys.” I found that idea from this beautiful party. I guess I forgot to take a picture, but I also had some cute rice crispy candy sushi that I had fun making. They were modeled after the ones at this party. I made a pagoda, which I copied from here. It was very easy to make with black wrapping paper (although I was sad I didn’t already have some–I don’t know what I’m going to use it for in the future) and red wrapping paper. I cut the pieces out of cardboard first, then wrapped them. I was thankful I hadn’t gotten rid of my borders (for the roof) from when I was an elementary teacher! My wonderful husband drew Lloyd, the green ninja–Mr. C’s favorite–with oil pastels. He’s now hanging (along with a lot of other party relics) on Mr. C’s wall. The kids had made these Chinese lanterns in church before, so I knew how easy it would be to make them. I found a template here, printed them on colored cardstock, and the kids and I cut them out and stapled them. It was a fun project for all of us! 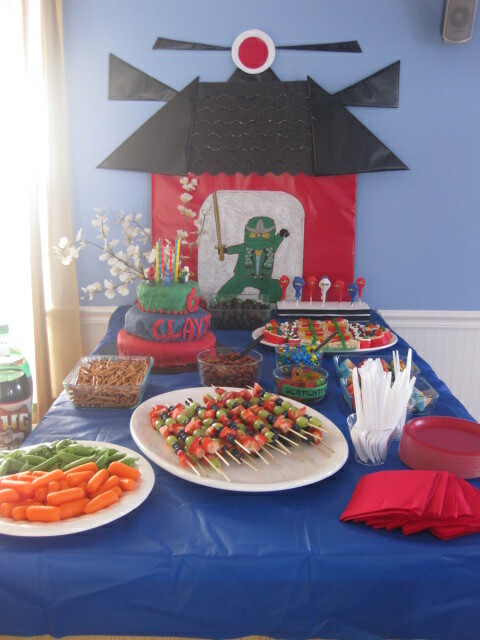 I found a lot of Ninjago parties that used black, red, and white as their major colors, and I thought it was so cute, but this year, I wanted Mr. C to be able to choose what he wanted, and he was sure that he wanted all the colors of the Ninjago characters. I thought it turned out cute anyway! 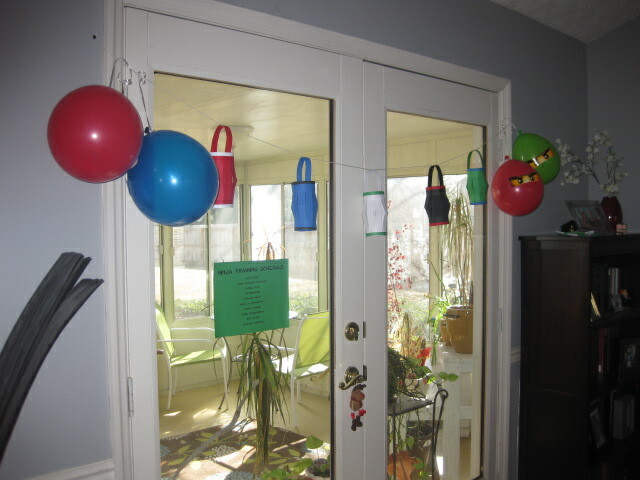 I saw the balloons with Ninjago eyes on a lot of sites, but this one was a good one! I didn’t end up using her link, though, since it wasn’t high enough resolution to print (like her, I printed them at Walmart to save ink). I ended up using this invitation instead, and just cut the eyes out. 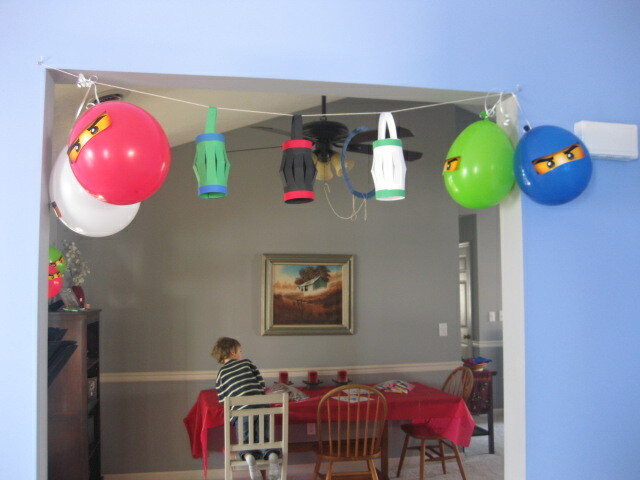 I liked the look of them with the balloons the opposite direction better, but since I’m cheap and don’t like to buy helium filled balloons, this worked just as well. It just made them look a little chubby. It was funny, though–I had to put a piece of tape between the ones that were close together. Otherwise, because of the static, they would all turn to face each other. They looked like they were all about to start fighting! 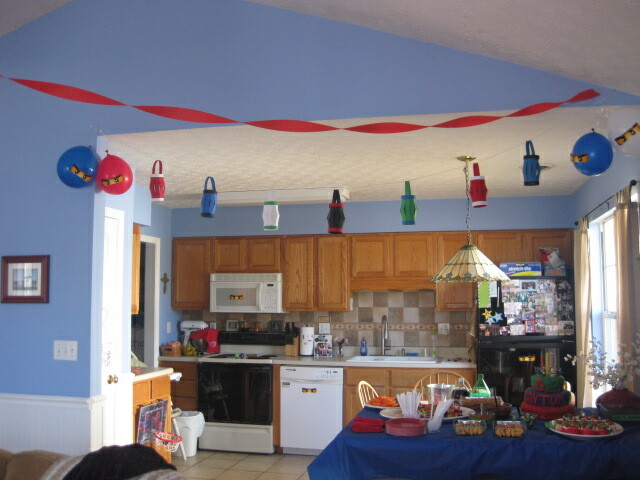 I guess I’ve spoiled Mr. C for parties because when I had all the lanterns and balloons up, I told him that I thought I was done with the major decorations, and he was disappointed–he thought it wasn’t enough. 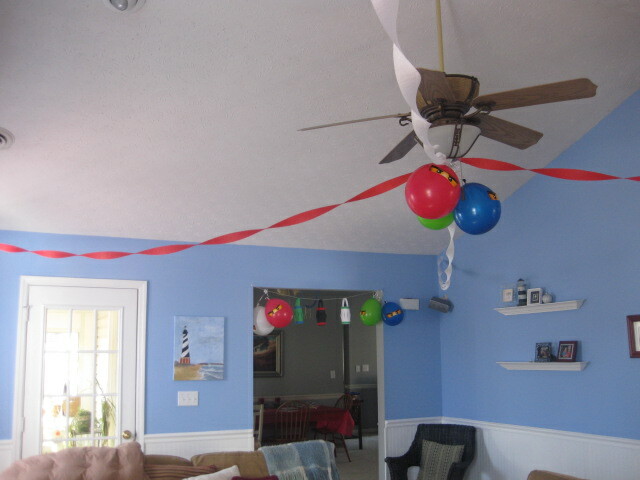 I had some extra streamers, though, so I guess I spoiled him some more by putting them up. 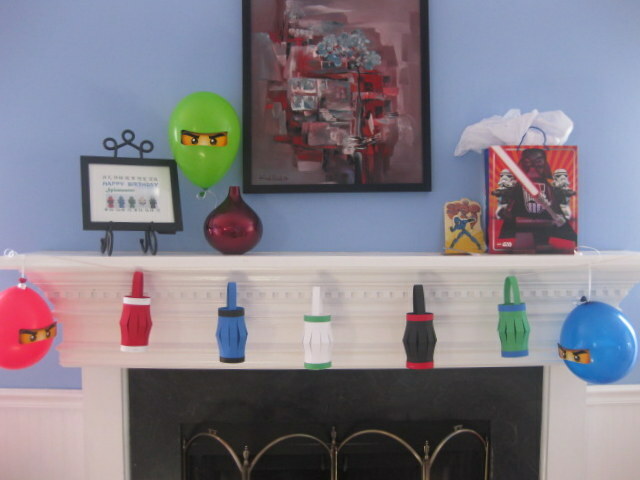 I didn’t have to buy them, and they weren’t any trouble to hang, and they satisfied him, so, oh well! Apparently a party isn’t a party without some streamers. 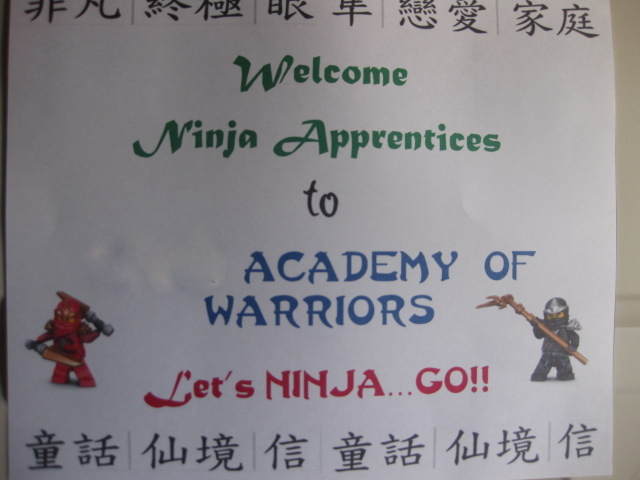 I had a list of the “Ninja Training Schedule” for the day, which were our activities. I found a lot of good activities here. I was actually really afraid of how this party would go since it was my first one with only boys. 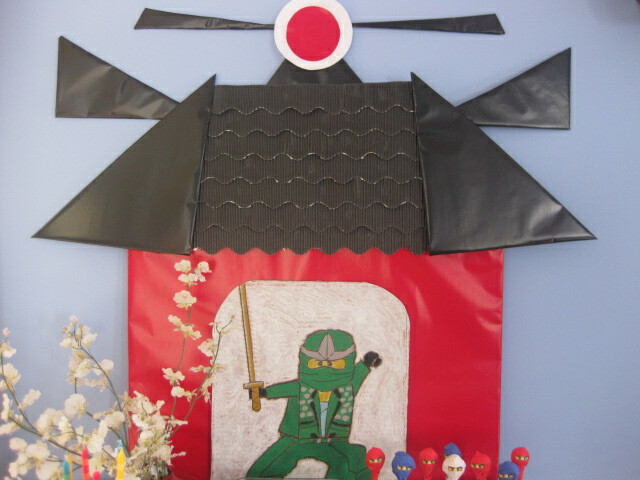 I was afraid they’d be wild ninjas, running around beating on each other, which is why I made a tight schedule. They only ended up with about ten minutes of free time! When they first came in, I was supposed to give them a short sleeved youth sized small or medium t-shirt in the colors of Ninjago for them to tie on their heads like ninjas, but I forgot until it was time to go outside. I got this idea here along with the idea to make this photo instruction card printed at Walmart that I included in their gift boxes. 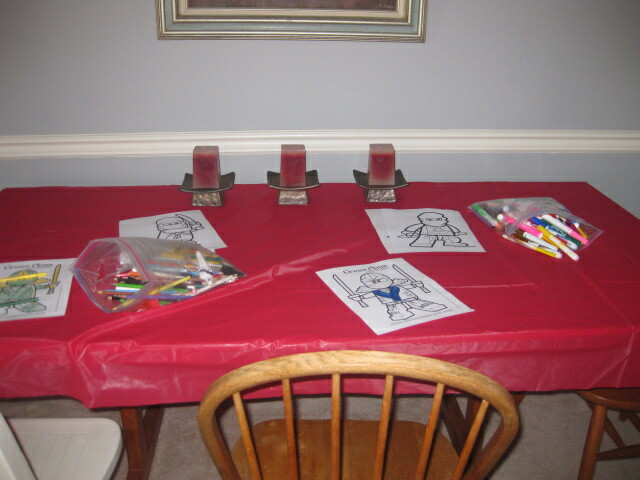 Their first activity was “Art Skills,” which was just coloring a Ninjago character while we waited for everyone to arrive. Next, I made a ring out of cardboard (I think it was the size of my largest bowl), covered with blue painter’s tape–believe me, you wouldn’t have wanted to see this picture–it wasn’t cute or pretty. I hung it from a rope tied to a ceiling fan, and the kids lined up for “Star Throwing Practice,” where they had three chances to throw a homemade ninja star (made beforehand from this video) through the ring. I wore my husband’s Vietnamese conical hat to be the Sensei. 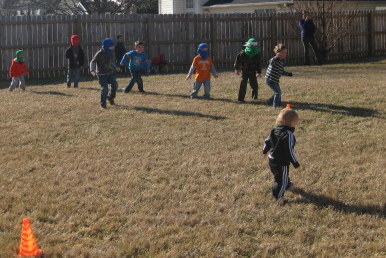 After that, we played “Sensei Says,” which is basically Simon Says with ninja flair. After I gave a few instructions, I let some of the kids take turns as the sensei by wearing the hat and giving the instructions. After snacks, we all went outside (and praise God it was one of the few beautiful warm days we had this winter–last time Mr. C had a birthday, it was snowing) and played “Stealth Ninja,” which was like “Red Light, Green Light,” except they were supposed to go in a sneaky, quiet way while my back was turned, and they were supposed to freeze when I turned around. They did freeze really well, but they didn’t do a good job being sneaky once the second round started. After that, they just ran! 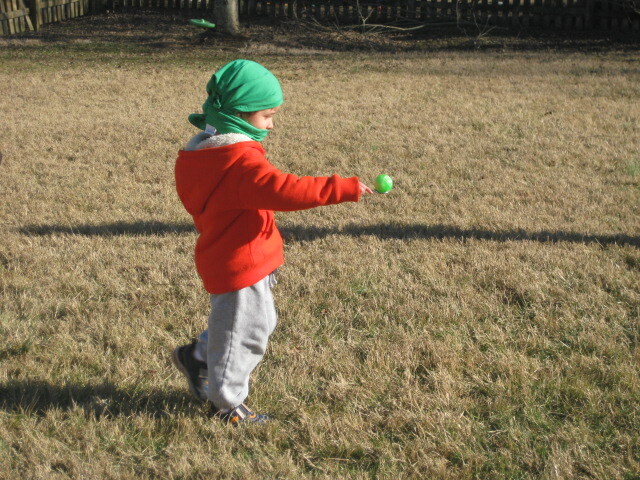 …pick up a bouncy ball with a spoon, and carry it back to their line, which signaled the next in line to do the same. The team that finished first won. It worked pretty well, except they didn’t go around the bat enough times to get dizzy. I should’ve had adults make them go around three times or so–it would have been more entertaining! At any rate, it was entertaining for the kids. 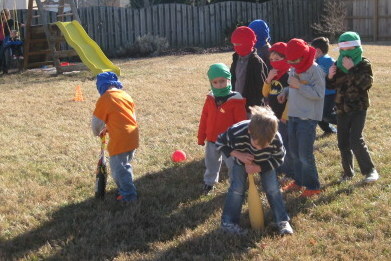 Then the kids played “Dodge Cannon.” They stayed inside a circle while we moms threw balls at them to get them out. The moms agreed that it was strangely therapeutic! At the beginning of each game, I told the kids how each game would make them better ninjas–to make them better weapon throwers, better listeners to their sensei, more stealthy, more agile, and better spinmasters. While we were outside, I finally let them have their ten minutes of free time–I figured that was better than inside the house! Of course, we also had our cake (don’t look too closely–it was almost a complete failure, but it ended up better than it could’ve been–since I blocked out Mr. C’s name, it looks even worse). It was chocolate cake (Mr. C’s favorite) with buttercream frosting, covered with molding chocolate, which is cheaper than fondant but has similar properties and is better tasting to some. The problem with it in my limited experience is that it dries out more quickly, which can be a big challenge. Here are instructions. 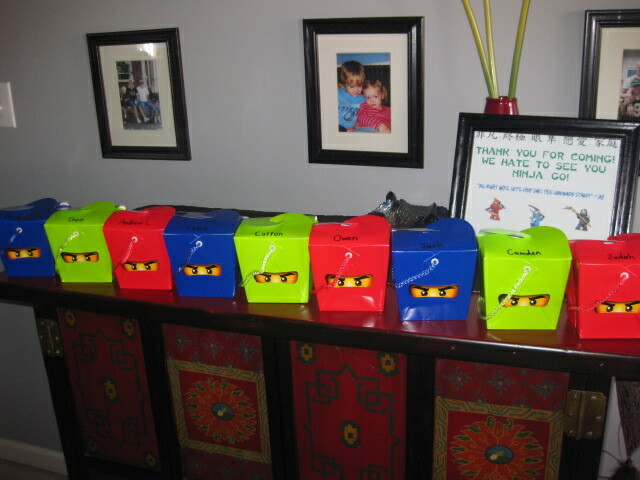 Here are the Ninjago favor boxes for each of the kids. 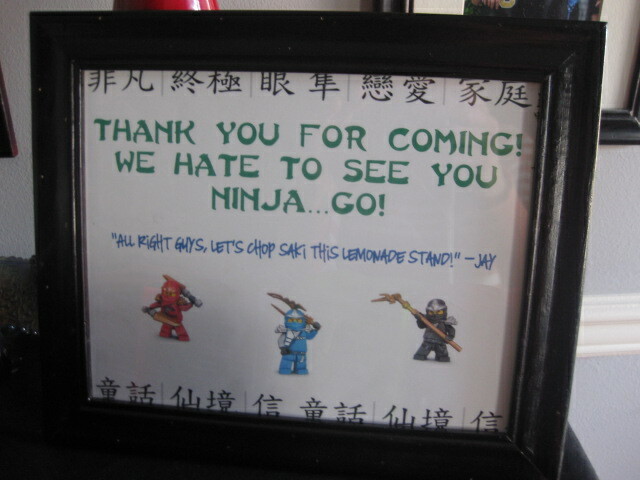 We had gone to Legoland a month or two before Mr. C’s birthday, so we bought Ninjago keychains there, as well as stickers. 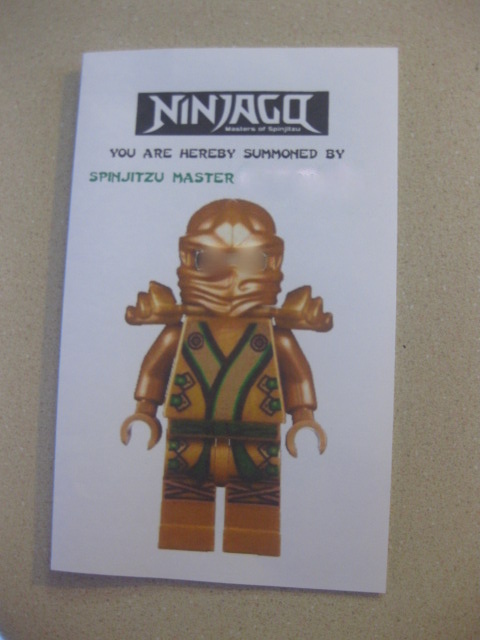 Each child received a keychain (which Mr. C said could spin around like a real Ninjago character unlike the actual Lego minifigures), a sticker page, a regular fortune cookie, the shirt already given, the instruction pictures I mentioned, and homemade folded paper ninja stars.